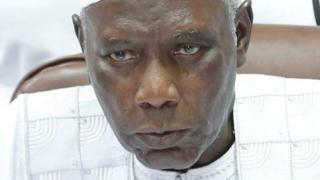 The Gambia's Independent Electoral Commission (IEC) chief has gone into hiding, his family has confirmed. Alieu Momar Njai, who announced Yahya Jammeh's defeat in the polls last month, has fled the country, his son Momodou told the BBC. President Jammeh initially accepted defeat, but then changed his mind and is now refusing to step down. Security forces took over the headquarters of the electoral commission shortly afterwards. Writing in a Facebook post on Tuesday evening, Momodou Alieu Njai said that his father was safe and thanked supporters for their prayers. President Jammeh, who has ruled The Gambia for 22 years, is due to be replaced by property developer Adama Barrow, who won elections on 1 December with more than 45% of the vote. Three private radio stations have been taken off air in the country since Sunday, in the first sign of a media crackdown since the president's election defeat. Diplomatic efforts to convince Mr Jammeh to accept defeat have so far proved unsuccessful. The West African regional bloc Ecowas, which has been leading these efforts, has threatened sanctions against Mr Jammeh if he does not step down.